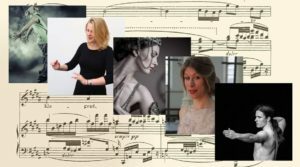 On Sunday, 2nd September, Emma will join members of Flow Performing Arts and pianist Isolde Troost in a presentation of classical music with difference dance forms. Dancers Florence Rapati, Jelle Chin and Thami Joe Fischer will perform in various dance styles including classical ballet, tap, and contemporary. Emma will join the dancers to sing Schubert’s Gretchen am Spinnrade, Grieg’s Ved Gjætle-Bekken, and Wagner’s Liebestod (arr. Liszt). The programme includes the Arabian Dance from The Nutcracker, Irene van Zeeland’s choreography for a piece by Philip Glass, Ravel’s Ondine, comic tap-dancing to Mozart’s Rondo alla Turca, and a piano solo written especially for Isolde Troost by Dutch composer Jannum Kruidhof: Daedalus en Icarus. Sunday, 1stSeptember, 14:00, Studio B in The Hague Openbare Bibliotheek, The Hague, the Netherlands.